Ever wondered what a Business Analytics Professional does in real life. What platform or software he/she uses? What are the analytics tools and techniques that make his/her life easier? Why is it important to have Business Analytics Training from a good institute? Excel is an MS office tool for data manipulation and visualization. 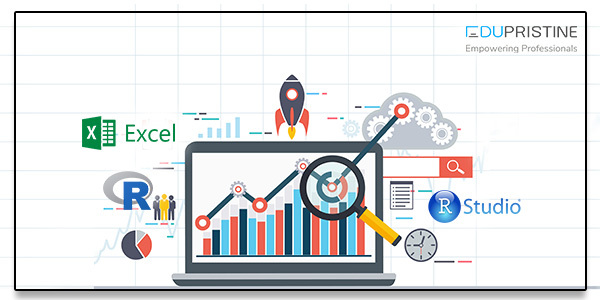 Lot of basic pre- and post-analysis from the tool are best done in excel and hence excel comes in very handy for any data scientist. However, most of the companies still use Excel for the initial level of analytics. R is a programming language. It is free software environment for statistical computing and graphics that is supported by the R Foundation for Statistical Computing. First of all, for running any machine learning algorithm, you will need a tool. Further, R is very easy to use, is open source and is very powerful in terms of its machine learning capability. Statistics is a branch of mathematics dealing with the collection, organization, analysis, interpretation, and presentation of data. Statistical understanding, especially inferential and applied statistics. Linear regression is used to model a linear relationship between an outcome variable, y, and a set of predictor variables x1, x2, etc. Thus, it is a supervised learning technique. Uses of Regressions: Regressions are commonly used in the machine learning field to predict continuous value. However, Regression task can predict the value of a dependent variable based on a set of independent variables. Predicting stock prices based on company performance, historical prices, etc. Predicting rainfall based time, temp, humidity, etc. Logistic regression is the appropriate regression analysis to conduct when the dependent variable is dichotomous (binary). Like all regression analyses, the logistic regression is a predictive analysis. Logistic regression is used to describe data and to explain the relationship between one dependent binary variable and one or more nominal, ordinal, interval or ratio-level independent variables. It is used when you want to solve a binary classification problem i.e. predict an outcome of a binary dependent variable. Time series analysis is a statistical technique that deals with time series data, or trend analysis. Time series data means that data is in a series of particular time periods or intervals. Thus, it is used when you have time series data, that is data with respective to specific time durations. Association rule mining is a procedure which aims to observe frequently occurring patterns, correlations, or associations from datasets found in various kinds of databases such as relational databases, transactional databases, and other forms of repositories. Hence, it is useful whenever you need to find frequent occurring patterns within a data. Decision tree is a type of supervised learning algorithm (having a pre-defined target variable). It is mostly use in classification problems. It works for both categorical and continuous input and output variables. Our students can expect a mix of case studies, analytics tools, and the hallmark pedagogy of learning through a plethora of hands-on and real-life scenarios. Finishing this business analytics course with our state-of-the-art Capstone project helps the participants to season their skills as a Business Analytics professional; thus, making them ready for the job role. Moreover, the methodology offers real-life challenges, compelling learners to apply concepts in the class and prepare for career realities. Moreover, EduPristine offers Business Analytics Training and certifications. Thus, good who wish to upgrade their analytical skills with the right analytics tools in order to benefit for a long-term in their careers. Previous Why Wait for the Future, When You Can Predict It with Predictive Business Analytics?